At the start of the year, I set myself a goal to sew one new thing a month. My plan was to make a different item than I have ever attempted before, or use a different or tricky fabric. So far I have stuck to this goal, albeit barely! January was a Peter Pan collar dress with a waistband. February was a loose fitting tee for my best friend, made from faux leather and a light, floaty patterned fabric that I have no name for. The first was a success, the second…well, I wasn’t overly happy with the end result. I used an existing shirt of hers to create the pattern which,in hindsight, wasn’t the best way to go given what I was working with. The seams were wavy, the sleeves were boxy and a little too GaGa-esque for either of our tastes. I made a couple of quick alterations, but all in all I was pretty disappointed. I also let time get away from me a little bit, and I know that if I had have taken the time, the result would have been better. The good thing about it, is that now I know my weaknesses when it comes to that kind of fabric, and I can work towards improving. Silver lining! March was a tricky month, and I very nearly didn’t make it. I went on holidays, and I made some small progress on a jumpsuit I’ve had planned since pretty much the start of the year, but then life got in the way. Now, by some wonderful circumstance, I managed to get two days off this week. Two consecutive days off. Which is pretty much a dream come true for me. So yesterday, I abandoned by jumpsuit idea altogether, because it is still too far from completion to get done in a day. Instead, I raced down to the local Lincraft and picked myself up a basic commercial pattern. I’m not usually a pattern kinda girl, preferring to make things up and challenge myself that way. But, desperate times and all that. 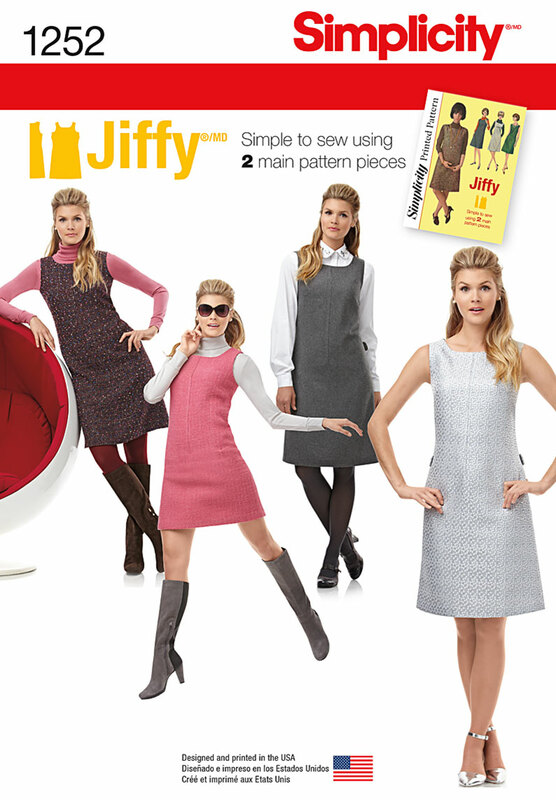 The pattern I went with was Simplicity 1252, a basic 60’s style sleeveless shift dress. The other night I caught a film called God Help the Girl (review pending), and I was inspired by the outfits in the film when I chose this pattern. Aside from wanting something I could smash out in an afternoon, I was looking to emulate the vaguely hipster-y, mod style of clothing worn in the film. I found some lightweight wool suiting in a dark green tartan that was perfect for the project – and at only $10 a metre! – and so I set to work. I count this my new thing for March, because all of the dresses I have previously made, have had a defined bust and skirt, where this dress is one piece. The pattern was simple to follow, and just as simple to put together, though I made a number of alterations. First thing I did was lose the neckline facings, in favour of a full lining. I wanted to be able to just slip the dress on, and the silk lining has the added bonus of helping to keep everything smooth. Secondly, the pattern has a front centre seam, which I think looks a little strange. I did actually add the dart in initially, but ended up unpicking it and leaving just a small detail at the top, and I liked it much better without. The third thing I did was alter the length. I always go a size up when I’m making commercial patterns, because I like to allow for error, so I used the size 10. When I cut out the pattern pieces, the finished dress would have sat at the awkward just below the knee length, because whilst I’m not overly short, I’m not especially tall either. And I wanted to make a mini dress anyway, more reminiscent of the fashion of the late 60’s. So I cut a solid three inches off the length, and then hemmed it with a 1/4 inch seam. I did have a little trouble when it came to hemming, because I was stitching the lining and the outer fabric together to hide the seams within, and the wool had a little stretch to it, where the lining silk didn’t. This left me with too much fabric at the end of the seam line, which created an unsightly wrinkle. To fix this, I simply unpicked the back seam a little, and did a little snipping and stitching to tidy it up and reduce the bulk. I just had to add a small slit in the back of the dress, but that doesn’t affect the aesthetic, so I was happy with the end result. All in all, I am infinitely happier with my March make than my previous month’s attempt, and I can see myself wearing this dress a lot, probably styled with a white collared shirt and a cute continental necktie. Or I can grunge it up with a pair of Docs (note to self; buy Docs) and a leather jacket. I think, because of my fabric choice, this will be a really versatile little number. Plus, I have plenty of fabric left over to make a pleated skirt and matching bow tie. So even though I left it until the last minute, and I used a commercial pattern, I am still going strong with this one new make a month goal. And I’m starting to get some ideas for the next ones too, so good things are coming! Good call on the front seam! Front seams are weird. Right?! I didn’t understand why it was there, so it got axed. To me, front seams make people look like furniture. Like they’re wearing the slipcover to grandma’s couch. I’ve not adapted a pattern to add a linig before.how did you do this and was it easy?